Limit after Limit, the Fishing is Ridiculously Good! March and April is going to be more and more of the same! Get in on these once in a life time trips! Save Up to $200 when you book in the month of March! 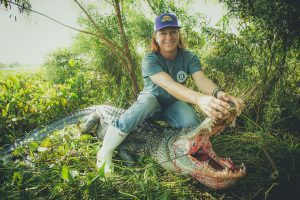 When you live in south Louisiana the month of February brings some warmer weather, the beginning season of crawfish, Mardi Gras, and some impeccable fishing. Our captains report limits of red fish and drum daily when on a charter! 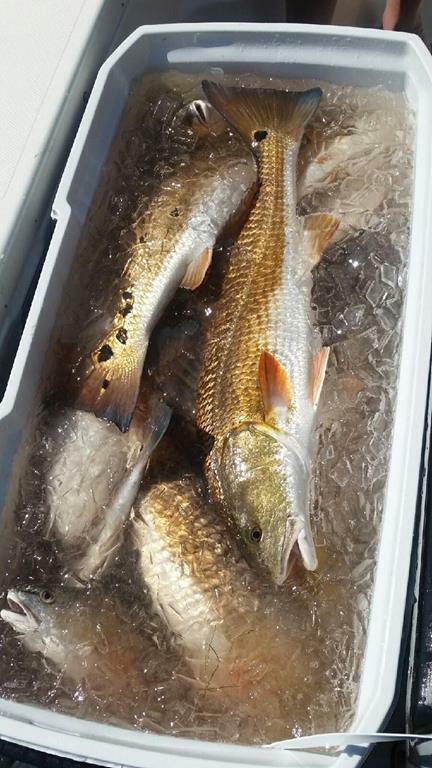 La-Charters started the month off fishing with bait. Towards the end of the month our captains have been able to fish the flats of Delacroix allowing them to sight fish and cast with plastics. 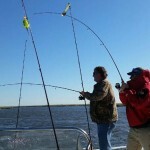 The trout fishing in the marshes of south Louisiana is just starting to heat up with the warmer weather. The trout are being caught with popping corks, plastics, and tight line. This February has been one of the best on record and with the spring fastly approaching the fishing should quickly take off. La-Charters is booking up quickly for the springtime, so give us a call today and book your charter! Please keep in mind when on a charter to protect your skin with appropriate clothing, hat, and sunscreen. Tune into our Facebook page for catch updates and last minute cancelations. What an awesome December fishing we have had due to all the unexpected warm weather! Now that the new year and the month of January is upon us, it seems all the fish are starting to go into their winter pattern. 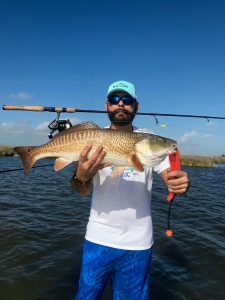 With the coming of cold fronts and water levels dropping, effects of the northwest wind, the redfish gather in specific spots, helping our captains catch them easily. In January, speckle trout are ideally better to catch on warmer days; when water temperature drops below 50°, these fish go into hibernation mode making them more of a challenge to catch. 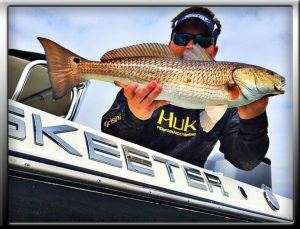 La-charters will be fishing Delacroix, Hopedale, Reggio, and Point la Hache areas during this month. Once again our charter captains will be leaving later in the morning making it ideal for those customers staying in downtown New Orleans or other surrounding cities. When booking a charter in the month of January please keep in mind to layer clothing and wear weather appropriate gear. Water resistant clothing is recommended but not required. Due to the amount to warmer weather Delacroix has had later in the season, the fishing should remain strong in the month of December. 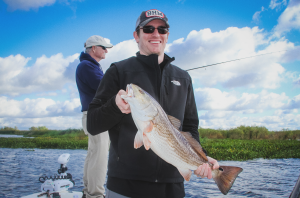 Louisiana Fishing Charters focuses on fishing areas where the shallow water merges with deeper water. In the wintertime when the temperature drops our captains focus on fishing in the deeper channels with shrimp or plastics. 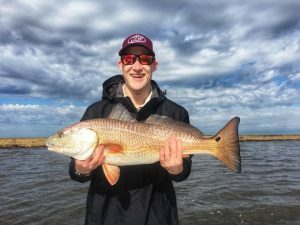 As temperature fluctuates often in South Louisiana in the month of December, on the warmer sunny days our captains convene on the flats catching fish with popping corks and plastics. 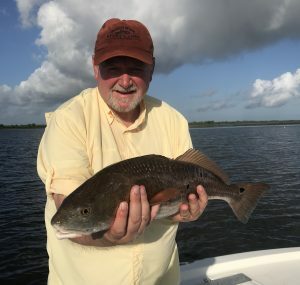 Red fish, black drum, and speckle trout with a few flounder mixed in, should all be seen within each cast while on a charter. Throughout the remainder of the winter our captains will focus on fishing later in the morning taking advantage of a later sun rise, benefiting those customers who enjoy the nightlife of downtown New Orleans. Make sure to check out our lodging tab; available January 2016 La-charters will offer new cabins for rent when booking a charter. 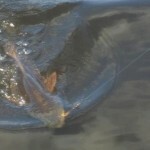 Make sure to explore our Facebook page and website for pictures of catches and fishing reports. Have a happy holiday season from the captains at Louisiana Fishing Charters. 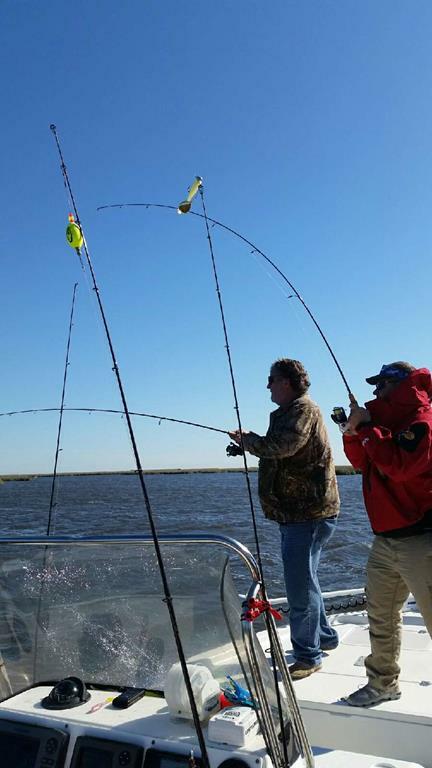 November is one of our favorite months for fishing at Louisiana Fishing Charters. The fall transition is over and with the many comings of cold fronts forcing bait is slowly leaving the marsh. With the cooling water temperatures the fish are starting to cluster becoming hungrier than ever with the winter vastly approaching. Instead of using live bait our captains are switching to plastics and dead bait. Now that fall is upon us, the fishing has become phenomenal; with strong east winds and high water the fish are migrating closer to the marinas. 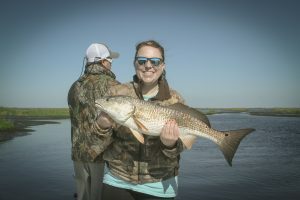 The redfish and speckle trout are schooling into their fall feeding patterns making it a frequent routine to have full limits of trout and redfish. The coming of cooler October whether is making it acceptable not to leave before sunrise. This has been another great year for fall fishing and we are hoping only to pick up more. We have been using live shrimp on our trips due to the magnitude of bait in the water. Make sure to check out our Facebook page and website for more information and pictures from our trips. 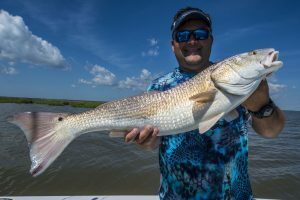 September is one of the hottest months for fishing at Louisiana Fishing Charters making it critical to leave early in the morning hours. This month is also the start of the transition for fish coming into the interior marshes of Delacroix. Bull-reds can be found on the outer edges of Black Bay, Breton Sound and the oilrigs. Schooled trout can also be found mixed in with these reds. Since these fish are in transition our captains will be fishing many spots and making it a routine to fish four or five different locations daily. Our Captains do not leave the dock without live bait this time of the year. Oh BOY! August is hot; thank goodness for the current 10-15mph winds we have been getting keeping the stiffiling temperatures bearable with some breezes. Due to these higher winds in Delacroix we have been forced to stay in the interior marshes to catch redfish. 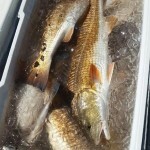 These redfish have been swimming thick in a few certain areas. We have been able to catch these fish with live shrimp or sight-fish them with plastics. When the winds have been at a minimum our captains run to Breton Sound and Black Bay to fish the rigs and islands making it possible to catch speckle trout limits fast and furiously with the occasional tarpon in the mix. This time of the year our charters leave before sunrise. If your come to Delacroix with your own vessel be aware of other boaters, make sure all safety equipment is equipped on boat, and make sure the proper lights are functional on your vessel. The weather is hot and the fishing is great. We love fishing the Delacroix, Breton sound area this time of the year. We are fishing rigs and reefs in Black Bay and it is not uncommon to catch a 25 fish per man limit by 9 am with a lot of big trout in the mix. The water in Black Bay is cooler and has more salt in it to hold these great trout. 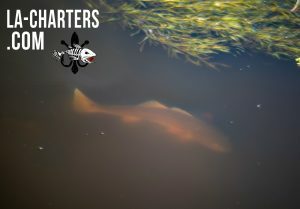 The Redfish are very thick in the marsh and are ranging from 2-10 lbs. 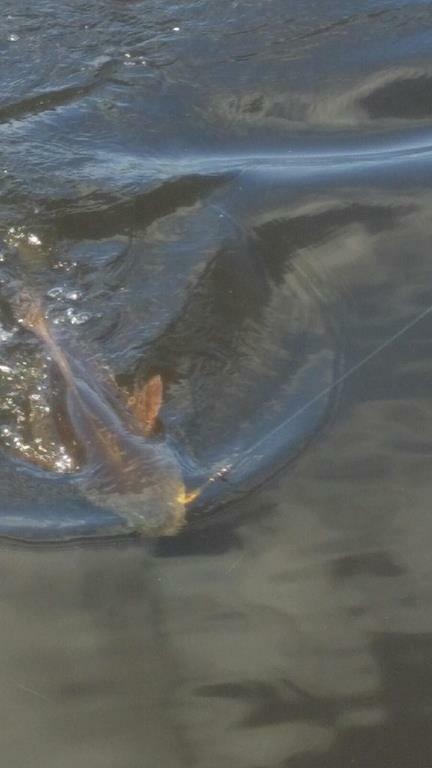 Redfish are being caught on bomber popping cork with dead bait. 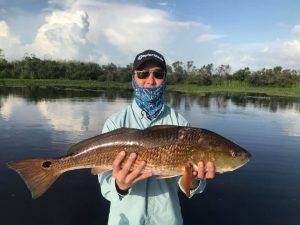 The Redfish and drum are aggressive this time of the year so limits happen just about every day. July is a Excellent month for fishing so give LFC a call or book online today! The Redfish are very thick in the marsh and are ranging from 2-10 lbs. 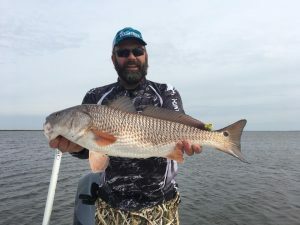 Redfish are being caught on bomber popping cork with dead bait. 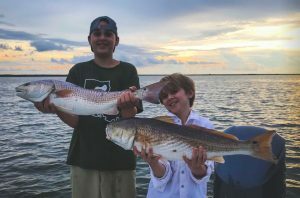 The Redfish and drum are aggressive this time of the year so limits happen just about every day. June is a Excellent month for fishing so give LFC a call or book online today! “They’re just everywhere. If you can find water movement on a point, you’re catching at least four or five there,” Shaw said. So as dismal as the weather has been for at least a week, things are looking up. And Shaw is excited about what the future holds.